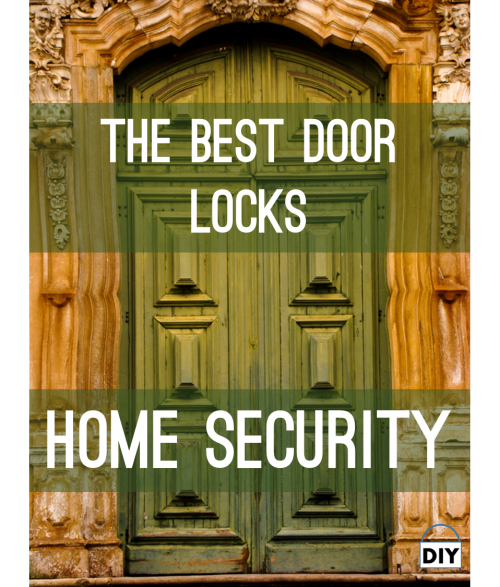 With the understanding that the lockset is what keeps the doorway secure, and not just the lock, we turn to the subject: The Best Door Locks – Home Security? What is the American National Standards Institute? What is the ANSI/BHMA grading system? Why is a deadbolt so important? What is key control all about? What is quick core change? 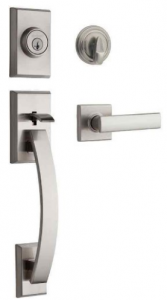 What are the best door locks? What is more important, your home or your shop/office? The American National Standards Institute, ANSI for short, is a private, nonprofit membership organization. How they do it? They accredit qualifying SDOs (Standards Developing Organizations) to work together to develop the standards and assessment systems. The BHMA (Builders Hardware Manufacturers Association) is the only accredited SDO to develop and maintain performance standards for locks and other builder’s hardware. What that means to you and me? It provides us clear, definable, marketplace standards when searching for the lock that will serve us best when trying to protect our family. 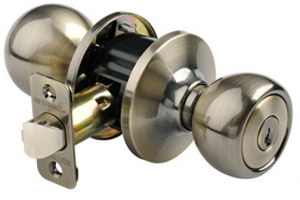 This system for deadbolts ranges from 1 (the highest grade) to 3 (the lowest grade). It factors in longevity of the lock, toughness, and latch length. Grade 1 is used where the toughest, most secure locks are needed. It is tested to withstand 1 million opening and closing cycles, has a 1-inch latch bolt (tongue), and can withstand 10 strikes of 75 pounds of force (150 foot-pounds). Grade 2 is a mid-grade lock. It is tested to withstand 800,000 opening and closing cycles, has a 5/8 inch latch bolt and can withstand 5 strikes of 75 pounds of force (120 foot-pounds). Grade 3 is similar to #2 in that it is also tested to withstand 800,000 opening and closing cycles and has a 5/8 inch latch bolt. However, it can only withstand 2 strikes of 75 pounds of force (90 foot-pounds). With the above information, I only use and recommend Grade #1 deadbolts for securing external doors. Of course, a deadbolt is only one piece of a solid lockset. A lockset is all the hardware used to lock a door. Whatever it takes to access (or stop someone from accessing) the space on the other side of your door is your lockset. I recently saw an expensive, keypad lock on a hollow door of an unoccupied house. That deadbolt will hold up to a brute force attack, but the door will not! Every piece of metal, particularly the strike plate, is potentially a weak link in your lockset. For more info read: What is the Best Door Jamb Reinforcement? The importance of a deadbolt is that it cannot be picked with a knife or other such object. 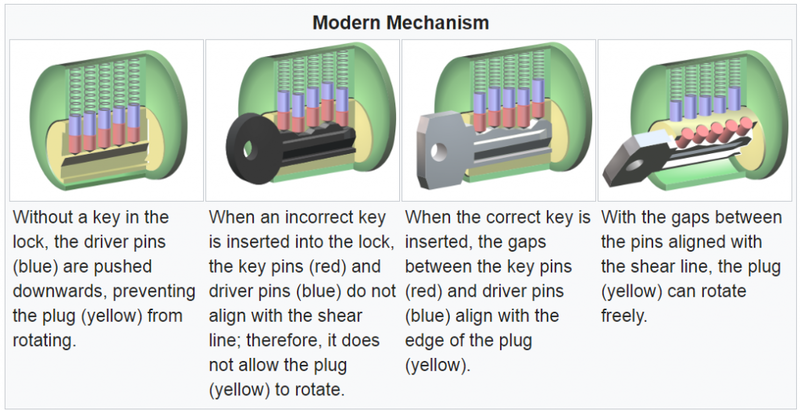 For that reason it is a “dead lock” and can only be moved to the open position by rotating the key, or the thumb turn on the inside of the door (as is the case of a single cylinder deadbolt). Conversely, a spring lock, like what you have in your door handle, is unlocked by compressing the spring and locked by releasing the spring. This type of lock is much easier to pick. Lock bumping is taking a key that fits a lock, but is not cut for it, putting it into the face and bumping it to bounce the tumblers. For the instant they bounce, the key is quickly turned and entry is gained. It is generally estimated that 90% of all residential and commercial locks in use are susceptible to bumping. This includes many that claim to be bump-proof. The reason for this is the use of pin tumblers. Lock bumping is also done with a pick or snap gun. (These can be purchased online for less than $50.) The gun is used to fire the rod up against the lock pins all at one time. For an instant, the cylinder is free and able to turn. The way your normal cylinder lock works is that bottom pins (red ones) are cut different lengths. The driver pins (blue ones) have springs forcing them into the cylinder which keeps it from turning, or locks it. Key control is when the blank keys that your keys are cut from, are NOT available to the public, don’t match your neighbors, and are held under tight restrictions. Have you ever had a spare house key made? That was possible because the store had blanks. Think about that. 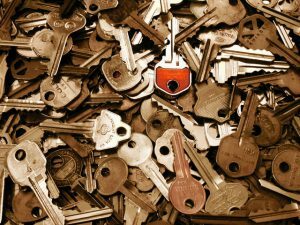 How many blank keys do you think there are to your home all over your city or county? When I was a teenager, another teen in the apartment complex took his apartment key and filed it down. He bragged about having access to all the other apartments in the complex. He was able to that because everyone in the development had keys cut from the same blank. There was no key control! High security organizations work with someone that does two things to practice key control. They have a patent on their keys. This way there is control over who makes key blanks. They manage a restricted distribution. This allows them to know who has the blanks and who cut what keys. The local big box hardware store is not in that loop. Quick core change means you can replace the core of the lock, and therefore the key, without have to remove the lock. In this way, time and money can be saved and security can be maintained. 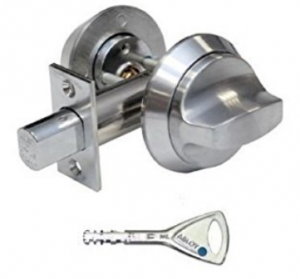 The best locks are going to be grade #1, 100% bump proof deadbolts. And if they have keys, they need quick core change and to be from a company that practices key control. The first two have no key hole, so there is no bumping. I like this lock by Lockey. I especially like the fact that it is old school and completely mechanical. That alone removes some issues consumers are having with smart locks, as you will see below. But try as I might, I could not find an ANSI grade for it. Schlage Touch series has reviewed great on build.com and amazon. However, they only use a grade 2 rated lock which for me is a big let down. Also, since 09/08/2016 they have installed an anti-drill plate which rightly caused some poor early reviews. 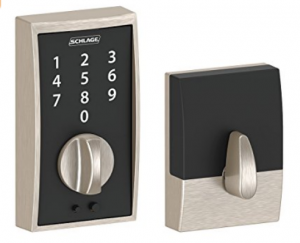 To get a grade #1 Schlage, you have to move up to their Connect Touchscreen deadbolt with alarm or the Schlage Sense Smart deadbolt. However, both of them have suffered poor customer reviews. I love technology. And I understand the flaws that come with early releases. But when it comes to my family’s security, I am not willing to chance it. Researchers at the excitingly named Implementation Security and Side-Channel Attacks Lab at Ben-Gurion University, writing in the less impressive sounding Smart Card Research and Advanced Applications journal, tested 16 smart home devices. The report has kept the identity of these smart home devices secret, or risk opening up owners of these devices to serious threat. But shockingly, of the 16 devices tested, flaws were found in 14. “It only took 30 minutes to find passwords for most of the devices, and some of them were found only through a Google search of the brand,” Omer Shwartz, a project researcher, told Digital Trends. It seems that leaving your security to smart devices is an idea that is a bit ahead of the tech. For now, smart defense wins out over smart devices. Another way to keep your lock from being picked or bumped is to use rotating discs like Abloy. Abloy does not use pins or springs, practices key control and provides a life-time warranty. However, a single cylinder Abloy, with shipping, will run you $300 to $400. The BiLock system includes two rows of pins and a cooperating side bar for each row. The final solution to bumping is programmable side bars. 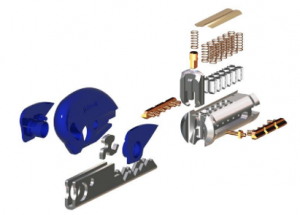 BiLock, which was developed by Australian Lock Company, has this type of mechanism. I found their tech to be fabulous. They build grade #1, quick core change deadbolts and they have patents on their keys. However, pricing was impossible to find. It appears, after spending a lot of time reading through their content, that they want you to purchase from one of their distributors. What I don’t understand is, why is it the “best” for home, but not the best for work? I would much rather you steal my insured stuff from a dark warehouse than to break into my home where my loved ones are. It is for this reason that I want my house as secure, if not more, as my place of work. How about you? Do you agree my assessment? Leave me a comment and I promise to get right back with you. And remember, being prepared means living without regret. Previous Post - Previous post: What is Essential for Home Security? Hi Chris, I found this quite fascinating. I have never heard of lock-bumping before. I also had no idea how a key actually works. Thanks for the visuals that explained how the red and blue mechanisms work and what opens the lock. I really found this very interesting. Thanks. Hi Brian, Great to hear from you again. I researched this post for two days and it took me where I was not planning on going. All that to say, I learned a lot as well. And your welcome. This is a great article. Home security is something most people take for granted…until their security fails them. I myself wasn’t aware of certain lock-picking techniques that you mentioned, so that was a bit eye-opening. You also backed up your points with facts about how certain things work (I liked the key demonstration, that was cool). Although I live in a city with the lowest crime rate in the world (at least, that’s what it seems like), I should be prepared. Thanks Isaac, The lock picking gif and pics were definitely cool Isaac, I agree. It is nice to live in a low crime area, can’t argue that. I also agree that we should be prepared regardless. I like to say that crime is at 100% for the victim. Very interesting information on door locks, accrediting organizations, mechanisms, and which locks are superior to others. I have been told that dead bolts are the best door locks, but good to know that grade 1, 100% bump proof deadbolts are the best deadbolt locks to have. I know that home break ins are at an all time high, so it is a good idea for us to maximize our home security to protect our families, and possessions. Thanks for reading Tom. It’s amazing that even most locksmiths will recommend your average grade #1 lock. Take care. Wow! Crazy to think that back in the day it was quite possible that anyone could have had access to my apartment at one time. Yikes! What a great read, this article was so engaging and interesting, I felt like I just learned a whole new lesson on locks and now I feel like my home needs an upgrade. Thank you so much for bringing this to my attention. Excellent website! Thanks Kristen. Most homes do need a security upgrade. Since I read that particular genre of news, I see the horror stories all too often. We definitely need an upgrade. Thanks that was an Interesting article. I hope a lot of people need do that Kay. Please share the information with your family and friends. Let’s keep our loved ones safe. Wow, I had never heard of lock bumping before. I have one door that goes from the backyard to the garage. It does not have a deadbolt, but there is no hole or anything drilled to add it. I will have to have a locksmith come out and do it, right? You can. But you probably know someone handy enough to do it for you and save you few bucks. It’s not difficult. Wow! That’s a great and very comprehensive guide on door locks and how to protect your home. I loved the excursion at the beginning on standardization and lock grades. What are your thoughts about security cameras? I’ve read different opinions on that topic: From people who tell you that you definitely need one, to burglars who will tell you that they don’t even care a bit! What’s your take? Thanks Chris, and good question. See Melissa’s comment on my post What Is Essential Home Security? where she relays how on 2 occasions their cameras were disconnected by thugs before they destroyed their stuff. Chris, I like cameras as a part of an overall security strategy, but only after defense and detection are fully completed. What is Essential for Home Security? Stop 64% of the burglars with home door security devices!